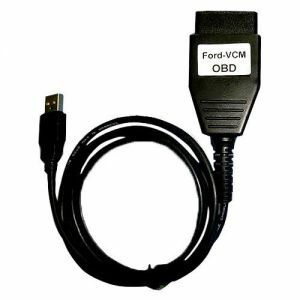 FORD-VCM OBD is professional device for ford vehicles, Ford-VCM OBD has the most functions of ford vcm ids, it is the mini version of ford vcm ids. Ford-VCM OBD works on ford car by OBD2 port directly. Ford-VCM OBD is diagnostic software for Ford vehicles. It is designed for ford, mazda and other few brand cars, really working very well with those cars 1996-2010, some 2011 cars. Ford-VCM OBD is diagnostic programmer for Ford vehicles 1996-2010. It can connect to various electronic control units (ECUs) and display identification, read and clear fault code memory, display and record measured values and perform actuator tests, some key programmer, etc. Ford-VCM OBD is able to connect to control units on all Ford vehicles 1996-2010. ECU identification, fault code memory reading and clearing works on all control units. Live data is available on all important ECUs in models such as Mondeo, Focus, Fiesta and other. Actuator tests and coding is available for most demanded control units. 1.Can Ford-VCM OBD clear MIL light? Yes, Ford-VCM OBD is capable of clearing PCM fault code memory. Please note that all problems need to be fixed, otherwise MIL comes up immediately again. 2.Can Ford-VCM OBD clear airbag (RCM) light? Yes, Ford-VCM OBD is capable of clearing airbag fault code memory. Please note that all airbag related problems need to be fixed manually. 3.Can Ford-VCM OBD perform key (immobilizer, PATS) learning? Yes. Ford-VCM OBD supports both coded and timed PATS. In connection with PATSCODE.com service you can do all immobilizer-related operations including ECU swapping. 4.Can Ford-VCM OBD read immobilizer (PATS) security pin code from ECUs ? 5.Can I use patscode.com in connection with Ford IDS (Ford VCM)? Yes, patscode can be used with both Ford-VCM OBD and Ford IDS. 6.Does Ford-VCM OBD work with ELM32x interface? No, Ford-VCM OBD requires proprietary interface because ELM32x-style interfaces do not support all protocols and pinouts to perform full diagnosis. 7.Is Ford-VCM OBD compatible with Ford Galaxy? Ford-VCM OBD is fully compatible with Ford Galaxy Mk3 manufactured since 2006. For Galaxy Mk1 and Mk2 (1995-2000, 2000-2006) you will need also VAG diagnostic tool as these cars are made in cooperation with Volkswagen Group and do not use Ford diagnostic protocols. 8.Is Ford-VCM OBD compatible with Ford Ka 2009? Ford Ka (model year 2009 and later) is manufactured in cooperation with Fiat. In fact this is Fiat-based, so you need to use tools such as Fiat Examiner to diagnose this vehicle. 9.On which vehicles does patscode.com work? patscode.com works on all Ford and Mazda vehicles equipped with coded PATS with one exception: 2010 Ford US models (European and some other 2010 Fords work fine). 10.What 3rd party products can be used with? In order to obtain INCODE you need to fill in at least VIN code and OUTCODE, which means that tools such as Ford IDS/VCM, MVP or AD100 will work. 11. What is MSCAN ? Bootloader is part of firmware code in control unit used for re-flashing purposes (it does not get updated during flash update process). 13.What is secondary bootloader (SBL) ? Secondary bootloader is code uploaded by Ford-VCM OBD to RAM of control unit. It is used for functions not supported by built-in bootloader. INCODE is response part of CODED PATS challenge-response authentication mechanism. It is 16bit hexadecimal number Ford-VCM OBD or other diagnosis tester needs to send to a control unit in order to complete PATS operation. This number can be obtained using patscode.com service. OUTCODE is challenge part of CODED PATS challenge-response authentication mechanism. It is 24bit hexadecimal number provided by a control unit. This number changes in time and is used by patscode.com service to calculate INCODE.